I often wonder what will I be like when G‑d heals me. Will I revert to how I was before ALS, or will I remain the man I have become due to the crushing years that I have endured? I hope that I remain the man I have become. There are many questions that could be asked on this verse. Firstly, when G‑d gave Moses a commandment to convey, the Torah would usually say, "And G‑d spoke to Moses, to say," or something similar. In our verse, however, there is no such preface. Moses' name is not even mentioned. It simply states, "And you command." What is the significance of this? Secondly, "And you shall command" implies that Moses will be commanding the Jewish people as if it were his commandment. Isn't it G‑d’s wish? Additionally, the verse says, "And they should take to you pure olive oil." Why did they have to bring olive oil to Moses? Wasn’t Aaron, the high priest, going to light the Menorah? Then it says, "crushed for a source of light (lamaor)." Why does it use the word “lamaor,” which means “a source of light”? 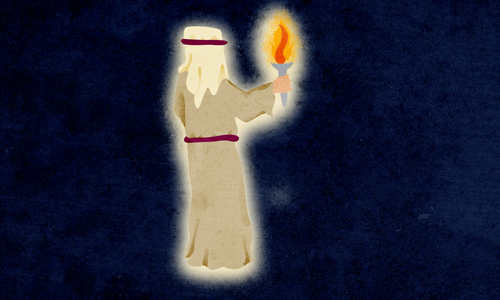 Why doesn't it simply say, “to illuminate” (leha’ir)?" The verse concludes, "to kindle a constant lamp." The Menorah was only obligated to be lit "from evening until morning,"2 as the next verse clarifies. Why, then, does it say "constant” (tamid)? Rashi explains that often, the Torah uses the word tamid (constant) to mean “regularly,” and, in our case, it means every evening. But we are left with the question: Why use the word tamid, when it could have used a term that actually means “regularly” or “nightly”? And finally, our verse says, tamid, while the next verse says, "from evening until morning." Why the need for both terms? What is the deeper significance of each term? Every verse in the Torah can be understood on many levels. In Chassidic teachings,3 tetzaveh is related to the term “tzavta v'chibur”, a connection. Here we are talking about the deepest sort of connection to G‑d, as will be explained. It is Moses, or the "Moses" of every generation, that brings out this connection between the Jewish people and G‑d. This verse is all about that connection. It uses the word v'atah, "and you," because it is referring the essence of Moses. This is an essential part of his purpose as the leader of the generation. Moses is called the “raya mehemna” (the faithful shepherd). This term could be explained in two ways. First, that this leader was faithfully leading the Jewish people. And second, that the leader is the one who nourishes the Jewish people’s faith. You may ask: Aren’t the Jewish people, "believers the children of believers? "4 Yes, but that is a general aspect of the Jewish people, and sometimes we only experience it as an external part of our makeup. The job of the Moses of every generation is to help us internalize it. As it says in the Zohar,5 "That the faith of above will be nourished and sustained by your [Moses'] hand." This is similar to the story of Purim, when Mordechai was the Moses of his generation, as our sages say, "Mordechai in his generation was like Moses in his generation. "6 Despite the fact that, during the time of Haman's decree, it was dangerous to learn Torah and do mitzvot, he held public gatherings to strengthen the Jewish people's faith in G‑d, and to keep the Jews strong in their performance of mitzvot and Torah study. This was true self-sacrifice for G‑d on behalf of every Jew,7 brought to the fore by the teachings and leadership of Mordechai. What was it that Mordechai brought out in the Jews, that caused them to be willing to sacrifice their lives for G‑d? Firstly, because, although we don't see G‑d, our souls do.8 That is why we find that Jewish people sometimes, for no apparent reason, have an awakening to strengthen their Judaism. This is because, the part of the soul that sees G‑d, flares up. Since the soul sees G‑d, we believe in Him. The problem with this experience is that it is outside of you. Your soul sees, therefore you believe. The second reason is that the root of our souls are one with the essence of G‑d, and that essence is higher than the part of the soul that sees G‑d. In other words, we are one with G‑d, and we believe, since that is what we are. This is not outside of you. This is in every part of your being, it is the essential you. Since we are in a physical body and in a physical world, our essence is hidden and it is possible not to experience it. However, there are two ways for it to be revealed. The first is when we are under oppression and our Judaism is under threat. That is why it is so common for Jews to sacrifice their lives when their Jewishness is threatened. This is even the case with the least observant Jewish people because it is who we are. This is what happened during Haman's decree, while we were crushed under oppression. The intrinsic connection to G‑d was revealed. It was Mordechai that inspired that revelation, through his teachings. Since the Jews’ essential connection with G‑d was revealed, it brought to the fore true self-sacrifice in every Jew. This is the idea of "crushed for a source of light," and not “for illumination.” Through being crushed under oppression, they revealed their connection with G‑d's essence, which is the source of the light. This revelation that comes from being crushed, although being incredible, has a flaw. As is commonly the case, that under oppression, a person will show his deep-seated connection to G‑d and tremendous self-sacrifice, but once he finds himself in relative freedom, you don't see it anymore. This is where a more consistent level of this revelation comes in to play. It is the job of the Moses of the generation to reveal this essential connection, even at times of relative freedom. This is what we learn from the words, "to kindle a constant lamp." It means to keep the connection open even when we are not crushed under oppression. Even though we are not crushed under oppression, we are still crushed. Here is how: Now that the bond with G‑d is revealed, we sense what G‑d really wants, we realize that we don't belong in exile and that we really need Moshiach. This understanding is crushing in its own right. You may ask: Why is it that the generation that stood at Mount Sinai, the holiest of generations, could not complete the acceptance of the Torah, whilst the generation that experienced the miracle of Purim, which was perhaps the lowest of generations spiritually, were able to complete the acceptance of the Torah? The answer: At the giving of the Torah, they experienced great open revelations and miracles and they were wowed by the lofty event. So it was imposed on them from above. But now they sacrificed to stay true to G‑d and to keep the Torah under Haman's decree, even in the absence of revelation. And, even after the miracle of Purim, when they had relative freedom, they kept the revelation of their essential connection with G‑d shining. That was all from their own initiative, so it was true acceptance. The way the Moses of the generation helps us reveal the essential bond is by providing the initial inspiration. We are, however, meant to take this inspiration and develop it into a constant state. When we do, we raise the Moses of the generation to a higher level as well. He is the head of the Jewish people, and we, being the legs, can take him to a place where he can't get on his own. Now we will be able to understand why they had to bring the olive oil to Moses. Because, through the crushing experience, we bring something new to Moses that he was unable to attain on his own. When the revelation is due to circumstances out of our control, like being crushed under oppression, it is only "from evening until morning," during the night, implying a time when the exile is dark, bitter and oppressive. Because, as was mentioned above, as soon as it becomes light, and when the oppression ends and a period of relative freedom begins, the revelation is no more. However, when we develop the connection to G‑d through our own effort, it becomes "constant." Hatamim booklet 7 p. 35c (336c) and on. Sefer Hamaamarim 5687 p. 110 and on, 5711 p. 180 and on. Torah Ohr parshas Tetzaveh p. 82a. Zohar volume 3 p. 295b. Especially since if they would have chosen to give up Judaism, they would have been spared, nevertheless, they didn't even consider it as an option (Torah Ohr, Megillat Esther 91b, 97a, 99b). Mazlaihu chazi, in the words of the Talmud, Megillah 3a. And see Hemshech 5672 volume 1 p. 114, volume 2 p. 1182. This is similar to the saying of our sages (Talmud, Shabbat 88a) on the verse, "They kept and accepted," (Esther 9:27) that they kept what they already accepted. Meaning that now they began to keep the Torah which they accepted at Mount Sinai, of their own volition. Based on Maamar V'ata Tetzaveh 5741, Torat Menachem Sefer Hamaamarim Meluket volume 3 pp. 34-43.